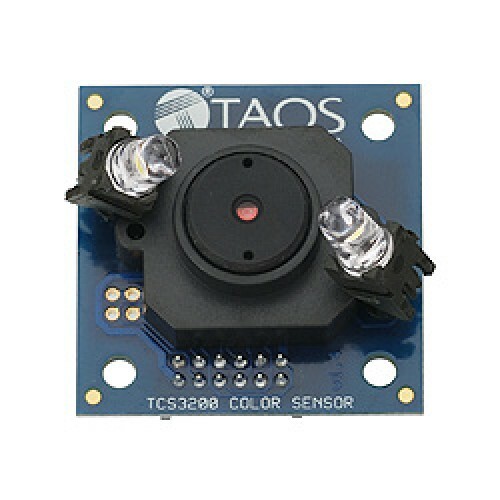 TCS3200 Color Sensor Daughterboard is a complete color detector, including a TAOS TCS3200 RGB sensor chip, white LEDs, collimator lens, and standoffs to set the optimum sensing distance. Compatible with any microcontroller. The TCS3200-DB can detect and measure a nearly limitless range of visible colors. Applications include test strip reading, sorting by color, ambient light sensing and calibration, and color matching, to name just a few. The Texas Advanced Optical Systems (TAOS) TSL230R sensor precisely measures light using an array of ..